Haryana Minister of State for Food, Civil Supplies and Consumer Affairs, Mr. Karan Dev Kamboj addressing a press conference at Chandigarh on August 9, 2018. Media Adviser to Chief Minister, Mr. Rajiv Jain also seen in the picture. Haryana government would soon start cashless facility in Public Distribution System (PDS). The minister of state for food, civil supplies and consumer affairs, Karan Dev Kamboj on Thursday said that cashless facility would be started as a pilot project in Panchkula district for depot holders and PDS consumers. Thereafter, the scheme would be implemented across the state. For this, current bank accounts of all depot holders are being opened in PNB Banks. 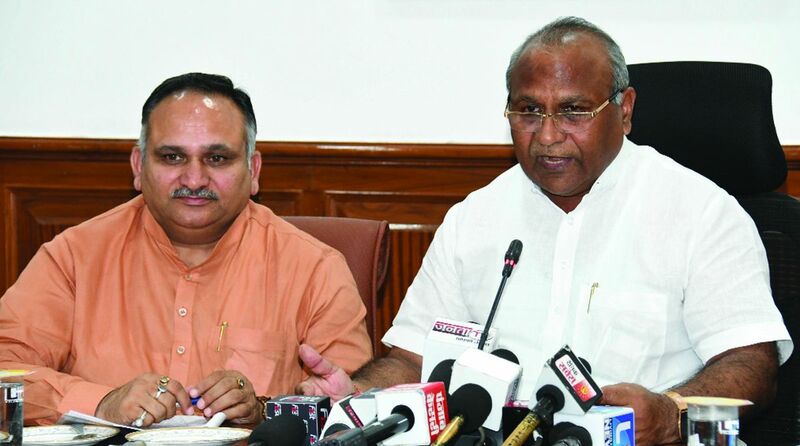 Addressing a Press conference, the minister said the state government would launch flour fortification scheme in Ambala and Karnal district from 1 November, 2018. Thereafter, the scheme would be implemented across the state. Under the first phase, fortified flour is already being distributed under PDS in two blocks namely Barara and Naraingarh of Ambala district. Kamboj said that the present state government is working to realise the vision of the Prime Minister, Narendra Modi. He said that Haryana is the first state in the country to become ‘kerosene free” by providing cooking gas connections to kerosene users. He said under Pradhan Mantri Ujjwala Yojana under which 5.12 lakh gas connections have so far been issued to people of the state at a cost of Rs 81.89 crore. The state government has extended this scheme till 31 March, 2019. He said that subsidy amounting to Rs 1,600 per family is being given on every gas connection. As many as six lakh people have been linked with Aadhaar to eliminate those who were taking kerosene illegally and provided free gas connections to families without LPG. Kamboj said that at present 9353 ration depots are functional in the state and POS machines have been installed at these depots. Till June 2013, there were 12.84 lakh BPL ration card holders and 54.41 lakh beneficiaries in the state. After implementation of National Food Security Bill, the number of beneficiaries has reached 1.37 Crore in the state. With a view to ensure providing timely ration to consumers in the state, they have been linked with Aadhaar which has resulted in ousting of 25 lakh fake beneficiaries that has saved Rs 400 Crore annually to the State exchequer. He said that the present state government has taken significant step of full automation of department under which beneficiaries and depot holders get SMS of challan generation right from truck carrying ration from godown and upto delivery.